1.Based on Artnet protocol,32 bit ARM processor,RJ45 network interface and standard dmx 512 output interface. 2.Can set two different IP address in each controller. 3.Set different network segments to avoid mltiple sets Artnet data interference. 4.Manage Artnet on broadcast mode or unicast mode. 5. LCD Screen display,convenient operation intuitive settings. 6. 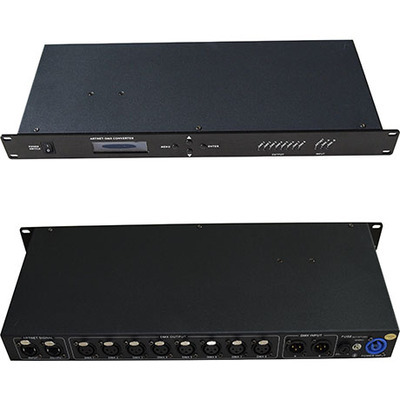 8 standard DMX 512 data output port and can output total 8*512 data. 7. compatiable with all artnet software.